Eagles Don Henley and Glenn Frey perform at the iWireless Center in Moline, Illinois Monday October 21, 2013. 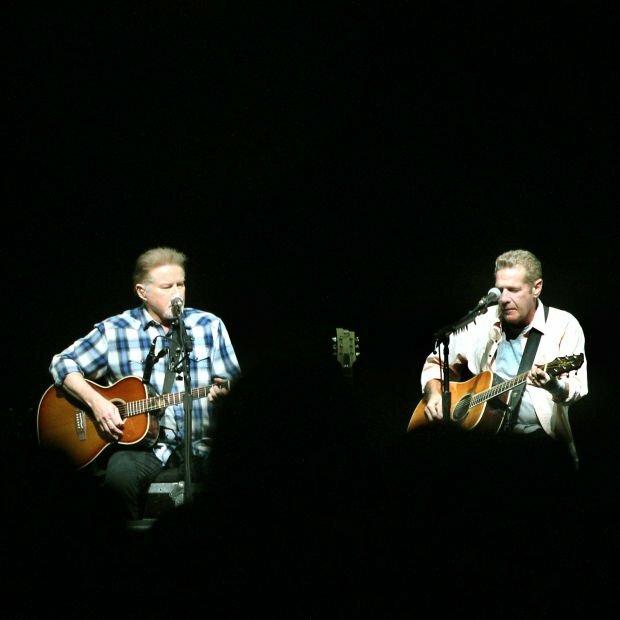 Don Henley and Glenn Frey are the first Eagles to take the stage at the iWireless Center in Moline, Illinois Monday October 21, 2013. 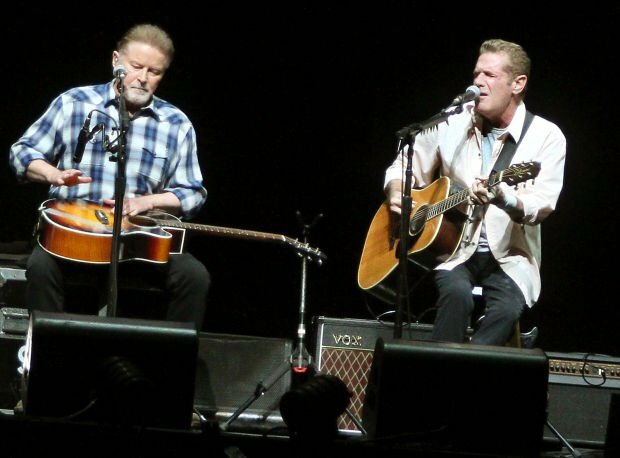 Don Henley and Glenn Frey take the stage first as the Eagles perform Monday night at the iWireless Center in Moline. Eagles Bernie Leadon and Don Henley perform at the iWireless Center in Moline, Illinois Monday October 21, 2013. Eagles perform at the iWireless Center in Moline, Illinois Monday October 21, 2013. It’s been a long, amazing journey from the “Hotel California” through hotels around the world for the Eagles, a band that certainly has seen its share of break-ups, shake-ups and make-ups but always seems to soar when the crowds roar and the lights blaze. It was no different Monday evening as the biggest-selling American band in rock history — Glenn Frey, Don Henley, Joe Walsh, Timothy B. Schmit and Bernie Leadon, along with various side men — strode the stage for more than two hours at Moline’s iWireless Center. They rekindled past magic and flew down memory lane for History of the Eagles, a combination of superb live music and “Behind the Music” style reminiscences via video and live chat for roughly 10,000 fans. The evening began stark and low key, as a few Spartan stage lights flicked on and Frey and Henley strolled out to cheers as they slung on the acoustics and smiled into the 1973 chestnut “Saturday Night,” a shimmery sigh to loves past. That flipped open the pages of the night, as Frey and Henley spun tales of their early days breaking off of Linda Ronstadt’s backing group and going their own way to create the signature sound of '70s folk rock. As they unspooled their night with tunes and tales, they were joined one by one by the musicians who would create the legend and light into the songs that were its soundtrack. As Henley thumped out a sleek, sinister groove, Joe Walsh cast his guitar spell over “Witchy Woman,” which ended with the first of many standing ovations of the night. “Tequila Sunrise” and “Desperado” had an anthemic, atmospheric feel to them, wafting over the crowd like a glistening mirage on the desert. “Best Of My Love,” the band’s first No. 1 hit, was lush and syrupy sweet, and the twisted venom of “Lyin’ Eyes” was an acrid bath of lyrical acid couched in a deceptively soft melody. And indeed, it was, for the most part, a peaceful, easy feeling that rolled over fans. Most were mellow, or danced, smiling, drifting along on a fluffy pilsner cloud. That said, there were a few that voiced their displeasure with the lengthy chats between songs, as one vocal gentleman within earshot of me and several thousand others diplomatically yelled, “Play the (expletive deleted) music!” more than once. Personally, I, and the fans around me, enjoyed the narrative. Like the fans sitting around me, I’ve seen the Eagles a few times, and the perspectives of the band members, mostly Frey and Henley, gave the tunes an added dimension and gave the evening a cool, laid back, homey feeling. There was no exploding pyro, no costume changes and no bombastic tromps around massive sets. It was just a group of talented musicians playing the music their followers have grown to love and pausing in between classic hits to weave a tale or two about their creation. But then again, that’s what you want from the Eagles — talented musicians playing brilliantly crafted rock songs. Sometimes, the simple things are the best.